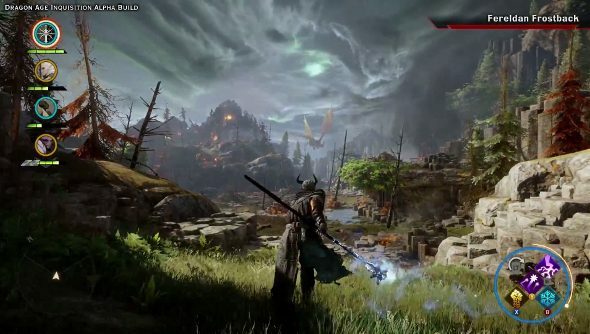 When Tim saw Dragon Age: Inquisition at E3 2014, he called the demo “absolutely stunning”. Seeing it now, just posted today by BioWare, with Mike Laidlaw narrating, it looks like he was right. The demo shows a mage and her party travelling through the Hinterlands and through Redcliffe, eventually facing one of the titular dragons in a flashy, but still rather tactical, battle. Take a gander below. The combat does look, as some feared, very much like an action game rather than the methodical fighting from Dragon Age: Origins and BioWare’s classic RPGs like Baldur’s Gate. However, the fight with the dragon and Laidlaw’s boasts about the enemy AI implies that there is tactical depth, but not much of it is being shown. It’s a 15 minute E3 demo, not exactly the right place for long, drawn out tactical scuffles. I’m currently arguing with myself over what species and class combination I’ll take for my first outing as an Inquisitor. Obviously the ability to play as one of the Qunari at long last is a tantalising one, and damn does the mage look like a whole lot of fun. What are you lovely lot leaning towards? Dragon Age: Inquisition is due out on October 7th.